Japanese Episode AG 038: "Purasuru to Mainan! Yama no Toudai!" American Episode 310: "A Different Kind of Misty"
On their way to Kinsetsu City, Satoshi and his friends reach an area covered by fog. Because of the low visibility, they run into the Rocket-Dan, who have stolen the Hikaru Ishi ("The Light Stone"), a stone that uses the power of electric pokemon to power a giant lighthouse. A young woman named Izuna attacks Satoshi and his friends, mistaking them for the thieves, but she soon apologizes when she realizes who the real culprits are. Izuna, along with her little brother Kazuchi, apologizes and takes everyone back to their village. Along the way, Kazuchi begins to idolize Satoshi, believing that he is the legendary hero who saved the village ages ago. After Satoshi teaches Kazuchi the essentials to being a hero, Izuna notices that the lighthouse has stopped glowing. When she arrives at the lighthouse, she finds the the Rocket-Dan stealing the stone again. Satoshi steps up to stop them, but they respond by taking his Pikachu! Satoshi doesn't give up, however, and has his pokemon use its electricity attacks on the stone in order to light up the stone, allowing the others to follow it. 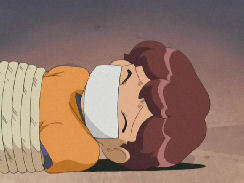 Satoshi and his friends eventually catch up to the Rocket-Dan, and after a short battle the Rocket trio is sent flying. The stone and Satoshi's Pikachu are all returned to their rightful owners, so Satoshi decides to continue on his journey. I thought this was an OK episode, even if the whole idea of the village depending on a special stone to power their lighthouse (instead of, say, a light bulb) is a bit out there. I wish they had played up the whole "Satoshi is the hero" angle a bit more, but what they did show was still good. One thing that surprised me was Izuna's strength; in the second half of the episode, Izuna catches her Coil (who's 6kg, or 13 lbs.) after it's thrown from mid-air, and then she later catches the Light Stone after that's thrown from the air. I don't care how strong she is--her arms should have snapped in half after catching that stone. I also think this is the first episode which features Masato pulling Takeshi away from the "pretty girl of the day." As far as the dub goes, there are more pointless edits, but other than that it's nothing too noteworthy. The episode's English title may be a little misleading for some, making them believe that this is the start of the famous Kasumi two-parter, but other than that I can't think of anything significant to report. 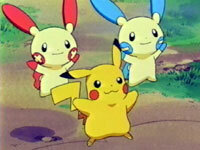 Both Plusle and Minun keep their Japanese voices, bringing the Houen total up to three. 4Kids makes a big old time cut at the beginning of the episode, shaving four seconds off the opening pan. 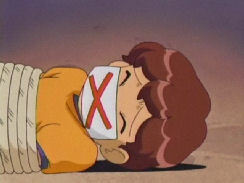 The X mark on Kazuchi's gag is digitally removed for the dub, because we all know how taboo that letter is. I could make some comment on how 4Kids has too much free time or something like that, but I've already said that enough times in all my other comparisons. A second is cut from the establishing shot of Izuna's village (after Ash's "So I'm the hero...sounds good to me!" line). Two seconds are cut from the first shot after the main commercial break. And hey, there's no time cut during the TO BE CONTINUED... screen! My guess is that 4Kids decided to make all the time cuts earlier in the episode to allow them to use the original music during the final scene.